Walking – healthy for the body and the mind, easy on the environment – it’s a great way to move around a city. Or at least it should be. Walking Saskatoon was established two years ago to advocate for better pedestrian infrastructure and development. Walking Saskatoon held its first public meeting on May 28, 2017, and highlighted three pressing issues. More information on all these topics is available on their website. The City of Saskatoon’s Active Transportation Plan Final Report highlights the benefits of walking and cycling. However, 25% of major and minor arterial streets have no sidewalks, which leaves some pretty big gaps, as demonstrated on the map on page 22 of the report. There is no ongoing budget item assigned to sidewalk infill; however, in 2016 and 2017, City Council allocated funds from the Traffic Safety Reserve (money from traffic cameras) to improve walkability (pedestrian crossings, new sidewalks). Locations with no sidewalks on either side of the road; sidewalks connecting to schools, parks, and bus stops; and locations identified through a Neighbourhood Traffic Review are the priority. 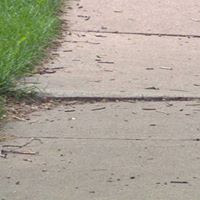 Only a fraction of the missing sidewalks can be replaced in a given year, and there is no guarantee of ongoing funding. Walking Saskatoon is advocating for increased funding and greater transparency of the process and the choice of priorities in order to ensure that pedestrians can walk safely on sidewalks throughout the city. They are currently profiling missing sidewalks on their Facebook and Twitter feeds with the hashtag #sidewhere. The bridge is scheduled for extensive maintenance work in the next few years, but current plans do not include any additions or improvements to the pedestrian crossing. Walking Saskatoon has been talking to City Councillors and planners, and several plans have been drawn up to improve the pedestrian crossing. One calls for wide walkways on both sides of the bridge, while the other would widen the existing walkway and provide a higher divider. Both proposals would come with a significantly lower price tag than the current long-term plan for a pedestrian bridge and would further the City’s goal to support active transportation. The advocacy group plans to take its proposal to the June 12 meeting of the City of Saskatoon’s Standing Committee on Transportation. Have you ever stood at a crossing and wondered why there’s a green light for vehicles but the signage for pedestrians says Don’t Walk? The signalling mismatch is caused by beg buttons; pedestrians need to hit the button to get a walk signal and extend the amount of time available to cross the street. The problem is that nobody knows how the walk signals work and they only affect some crossings. You’ll get a walk signal in downtown Saskatoon without pressing a button. If you want to cross Broadway Avenue, you’ll have to press the button. On top of that, you have to press the button at just the right time, or it won’t work. Walking Saskatoon welcomes new members. You can follow their activities on their website, Facebook, or Twitter. If you live in Regina, you can follow Sidewalks of Regina on Facebook or on Twitter. You can follow EcoFriendly Sask by liking us on Facebook, following us on Twitter, or by subscribing to our postings by email from the top right hand corner of our website.